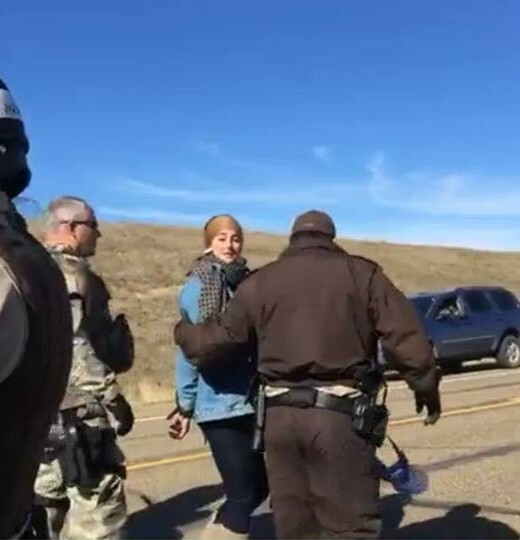 Actress Shailene Woodley and activist Vic Camp just arrested by riot police, among 27 arrested. Two charged with felonies who were locked down to DAPL machinery. 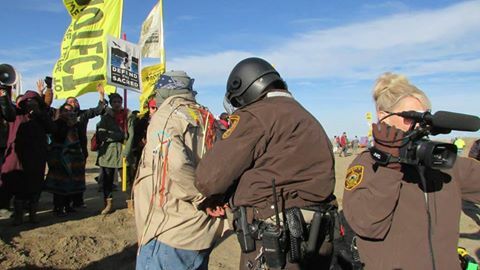 Oglala Lakota Vic Camp of Pine Ridge arrested today. Photo by Sacheen Seitcham. 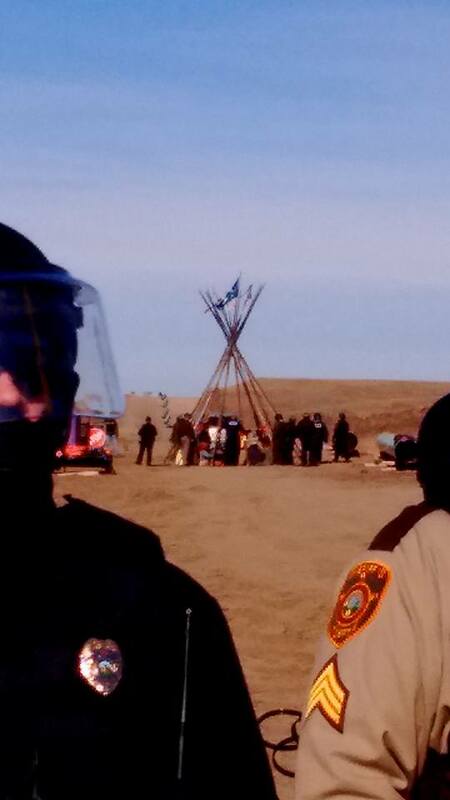 Photo by Joye Braun, Lakota, on the frontline now. Scroll down for more photos. 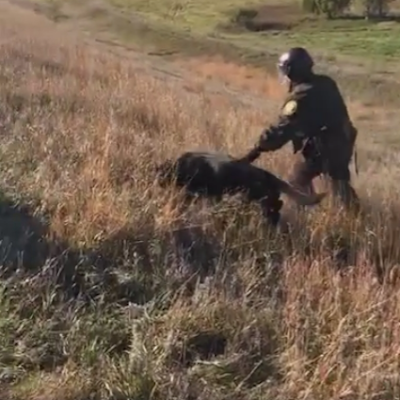 Water protectors in tipi arrested, slammed face down into the ground. 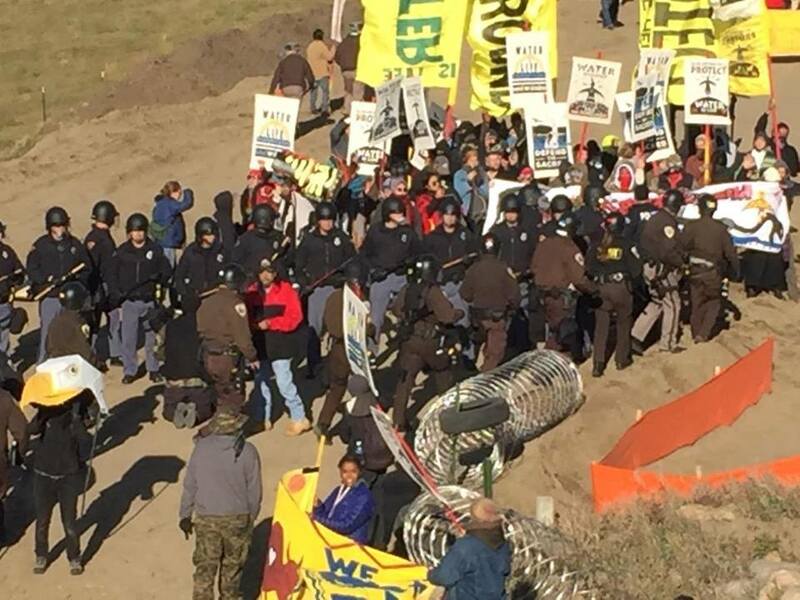 ST. ANTHONY, North Dakota -- Twenty-seven water protectors were arrested today, including two charged with felonies who were locked down to Dakota Access Pipeline machinery. Actress Shailene Woodley was arrested by riot police, as police continue to target livestreamers and members of the media. Activist Vic Camp was also just arrested. Twenty-five water protectors were arrested by riot police, and two others were arrested and charged with felonies who locked down to Dakota Access Pipeline construction machinery. Shailene had just finished livestreaming, as riot police arrived with armored vehicles in riot gear. Water protectors seated in a tipi were arrested and slammed to the ground by police. 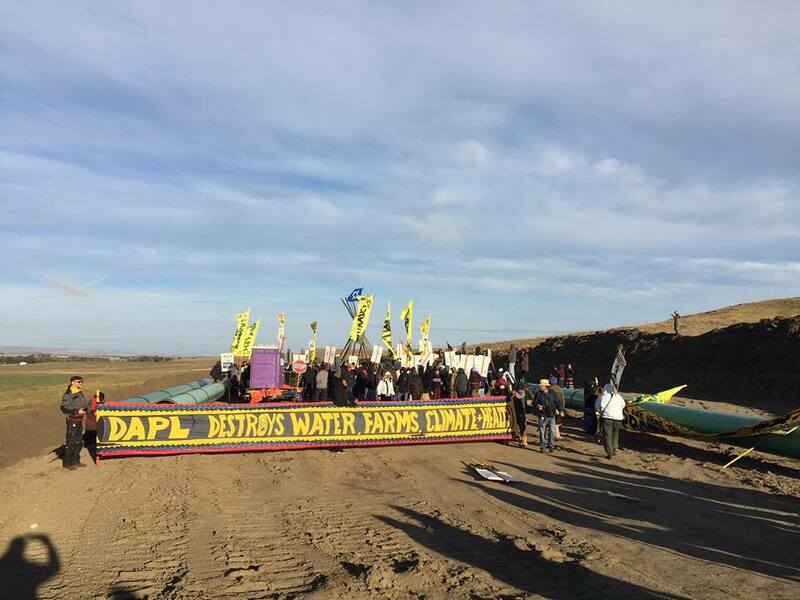 Water protectors said at 11 a.m. today that they woke at sunrise for prayer. 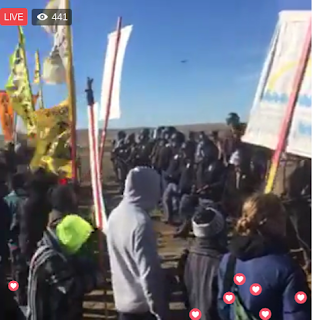 Water protectors then raveled by way of caravan to a pipeline construction site and erected tipi poles. Two miles away, allies were locked down to machinery since 5:30 a.m.
Police began targeting the media and livestreamers with criminal trespass charges that were dated Sept. 3. 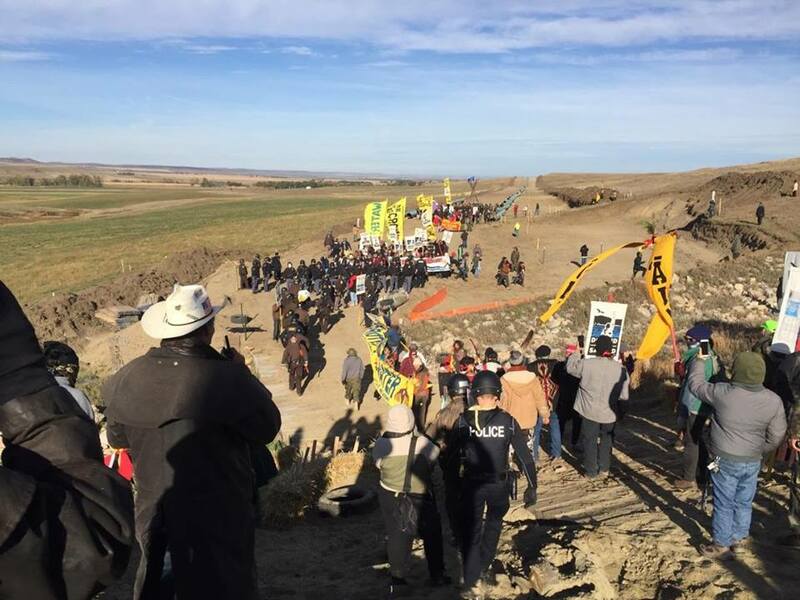 On this day, bulldozers tore across ancestral burial places and water protectors were attacked with vicious dogs and pepper spray. Democracy Now! producer Amy Goodman is charged with criminal trespass for her coverage. Cody Hall, media spokesman for Red Warrior Camp, spent four days in jail on criminal trespass charges. Unicorn Riot was arrested and jailed while livestreaming. detenida por transmitir en vivo. Shailene se unió a los corredores indígenas en Washington D.C.
y recientemente co-protagonizó la película 'Snowden." Protectores del agua en un tipi detenidos, golpeados boca abajo contra el suelo. ST. ANTHONY, Dakota del Norte, Estados Unidos - Veintisiete protectores del agua fueron detenidos, incluyendo dos, a quienes se les acusó de delitos por encadenarse a la maquinaria del Oleoducto Petrolero Acceso a Dakota (DAPL, por sus siglas en inglés). La actriz Shailene Woodley fue detenida por la policía antimotines, como parte de las acciones continuas de la policía que sigue arrestando a quienes están transmitiendo en vivo por las redes sociales y a los miembros de los medios de comunicación. El activista Vic Camp también fue detenido. Veinticinco protectores del agua (como se hacen llamar los activistas) fueron detenidos por la policía antimotines. Otros dos fueron detenidos y acusados de delitos relacionados con encadenarse a la maquinaria de construcción del oleoducto acceso de Dakota. Shailene acababa de terminar su transmisión en vivo por las redes sociales, cuando la policía antidisturbios llegó con vehículos blindados. Los protectores del agua, que estaban sentados en una estructura con la forma de un tipi con palos largos, fueron detenidos y los azotaron boca abajo contra el suelo. Los protectores del agua dijeron a las 11 a.m. de hoy que despertaron al amanecer para la oración y después, se fueron en caravana a un sitio de la construcción de oleoductos y erigieron un tipi. A dos millas de distancia, algunos aliados se encadenaron a la maquinaria de construcción desde las 5:30 de la mañana. La policía comenzó a atacar a los medios de comunicación y a quienes transmitían en vivo por las redes sociales. Se les presentaron cargos de allanamiento ilegal de propiedad ajena fechados el "3 de septiembre." En ese día, las excavadoras destruyeron tierras ancestrales donde había sepulturas indígenas históricas y los protectores del agua fueron atacados con perros de ataque y gas pimienta. La productora del noticiero en inglés, ”Democracy Now! ", Amy Goodman, fue acusada de allanamiento de propiedad ajena por su cobertura. Cody Hall, portavoz de los medios de comunicación para Red Warrior Camp, pasó cuatro días en la cárcel por los mismos cargos. Unicornio Riot fue detenido y encarcelado mientras transmitía en vivo por redes sociales. Depuis le 28 septembre, les camps de résistants pacifiques de Standing Rock sont encerclés par les forces de l’ordre. Entretemps, des unités de combat armées de fusils mitrailleurs ont été dépêchées sur place. Une force disproportionnée est utilisée contre des résistants déterminés mais pacifiques, parmi lesquels se trouvent des femmes, des enfants et des personnes âgées ou handicapées. L’actrice Shailene Woodley et l’activiste Vic Camp viennent d’être arrêtés par la police anti-émeute, parmi 27 personnes arrêtées. Encore deux personnes inculpées pour s’être enchaînées à des machines de DAPL. Des protecteurs de l’eau arrêtés dans un tipi et jetés face contre terre. ST.ANTHONY, Dakota du Nord – Vingt-sept personnes ont été arrêtées ce lundi 10 octobre, dont deux ont été mises en accusation pour s’être enchaînées à des machines de Dakota Access Pipeline. L’actrice Shailene Woodley a été arrêtée par la police anti-émeute, étant donné que la police continue à s’en prendre à ceux qui filment ou envoient des nouvelles en direct et aux représentants des médias. L’activiste Vic Camp vient aussi d’être arrêté. Vingt-cinq protecteurs de l’eau ont été également arrêtés par la police anti-émeute, et deux autres ont été inculpés pour s’être enchaînés à des machines de construction. Shailene venait juste de finir de filmer à l’arrivée de la police dans des blindés et en tenue de combat. Des protecteurs de l’eau assis dans un tipi ont été arrêtés et jetés à terre par la police. Des protecteurs de l’eau dirent à 11h ce matin qu’ils s’étaient levés à l’aube pour prier. Puis ils sont partis en caravane vers un site de construction du pipeline et ont érigé des poteaux pour monter un tipi. 3,6 km plus loin, des alliés s’enchaînaient à des machines depuis 5h30 du matin. La police a commencé par s’en prendre aux médias et aux gens qui filmaient en direct sur la base d’accusations d’effractions datant du 3 septembre. Ce jour-là, des bulldozers avaient éventré des sites funéraires ancestraux et les protecteurs de l’eau avaient été attaqués avec des chiens méchants et arrosés de poivre. La productrice de Democracy Now!, Amy Goodman, est toujours poursuivie pour ‘effraction’ à cause de son reportage. Cody Hall, le porte-parole du Red Warrior Camp pour les médias, a passé quatre jours en prison et est également accusé d’effraction. Le caméraman de Unicorn Riot a été arrêté et emprisonné alors qu’il était en train de filmer. Riot police with police dog today. Liz McKenzie, Dineh, live on the frontline! 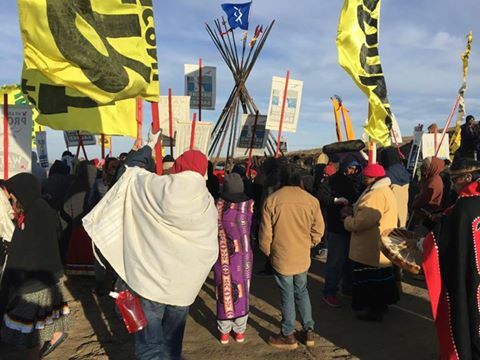 in the new 'Snowden' film, is live at Standing Rock now! That's $50,000 for each American household. USA, About 50% of your income taxes go towards war. This destruction and desecration is gonna stop. We all will make it stop. It is time. Just think of what happens to American people when there are no cameras or news coverage. Innocent citizens brutally beaten, tasered, shot, even murdered by the police. Then charges framed against them by the prosecutors. Tamer Rice, a twelve year old boy, playing in the park after school was immediately murdered by police as they had just arrived at the park. Police acting as judge, jury, executioners. Think of how those police, prosecutors, judges feel hatred towards American Indians every day and what violence happens to the indigenous people living there every day. Its difficult for some people who like Indians to understand that there are American people who HATE American Indians. Propaganda Distraction Technique: How often does the court render decisions on Sundays? How often does the court announce decisions immediately prior to a presidential debate? Almost never. A majority of peoples' attention has been redirected from Standing Rock and transforming "Columbus Day" into Indigenous Peoples Day towards the presidential debates. Given that, what will happen over the next few days is important. Most mass media news outlets will focus on the post presidential debates with perhaps some marginalized media coverage about Indigenous Peoples Day and will continue its censorship regarding the Dakota Access "black snake". Another factor to consider is the potential provocation by Dakota Access, GS4, the Morton County Sheriff's department, and the National Guard now that the court has rendered an unfavorable ruling for Indigenous peoples and their respective First Nations, Mother Earth and everything she culturally sustains for "The Peoples". Standing Rock is already a Success. So many people did not want indigenous & all races to come together at Standing Rock but every day people put their own lives in peril and stood strong. Standing Rock will never go away. Standing Rock can not be taken back. The success of Standing Rock has already happened and is occurring. Excellent informed and intelligent comments. Standing Rock is just the beginning of a new dawn for humans of the world. No more fracking, dirty oil, or big business over the wellness of the Earth. We ALL live here.